I started out with a more colorful plan, but this shade of green is my personal favorite and it just seemed perfect in this monochromatic scheme. I think that’s a truly lovely thought, don’t you? I am so utterly smitten with this; I may have to make one for myself! A teen can easily handle all of the steps here and all of the accessories were found in the dollar bins, so it’s a very affordable project too! 1. Make sure pot and saucer are clean and dry. Mix your paints to make a darker and lighter green. Add a small amount of yellow for the dark green and a larger amount for the lighter. 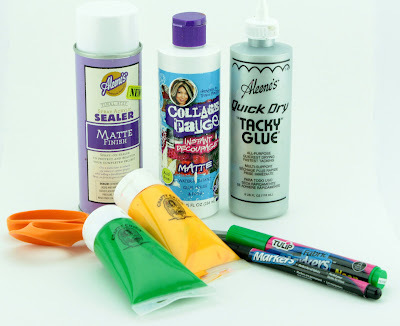 You will need to mix up a fair amount of paint here so the colors remain the same, small plastic drink cups and popsicle sticks work well for this task! 2. 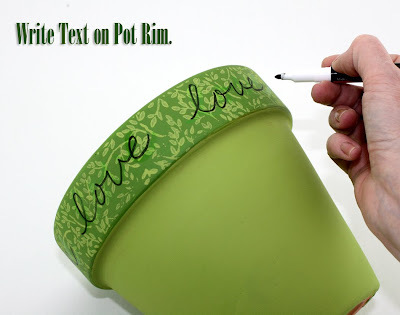 Use a foam brush to paint the body and inside of the pot and inside and bottom half of the saucer lighter green. This will probably take 2-3 coats, allow to dry in between. Use another foam brush to paint the edge of the pot and saucer darker green, also using 2-3 coats and allowing to dry. 3. Paint heart ornament on both sides and edges in the light green, 2 coats, and allow to dry. 4. 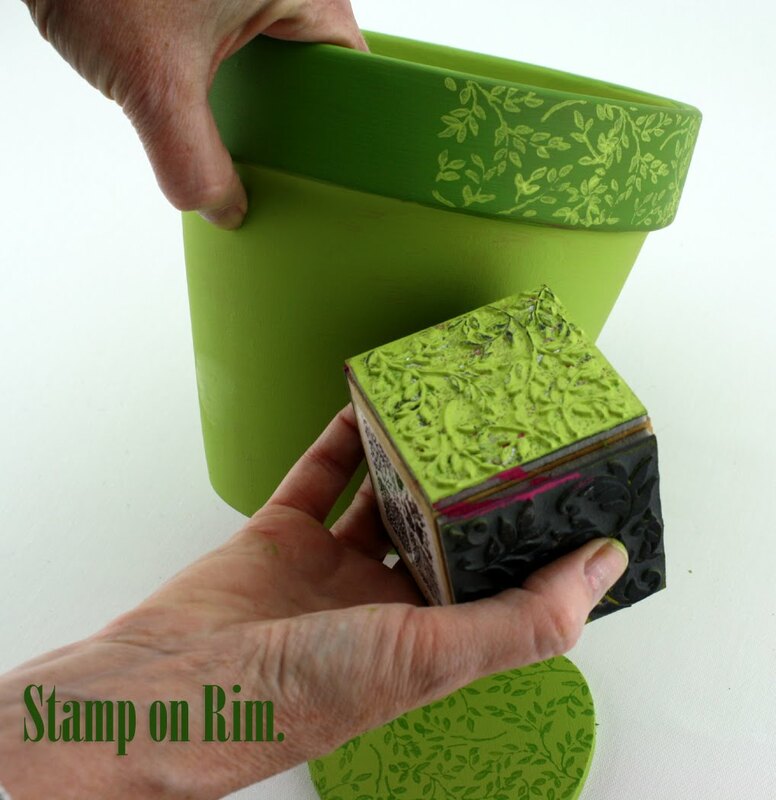 Use a paint pouncer to gently apply a layer of light green paint to top of rubber stamp. Rock the stamp from left to right around edge of pot and saucer, taking your time to avoid overlapping. This is meant to be organic, so no worries if it isn’t perfectly perfect. Allow this to dry. Use pouncer, rubber stamp and darker paint to stamp the surface of the heart ornament on front and back. Allow to dry. 6. 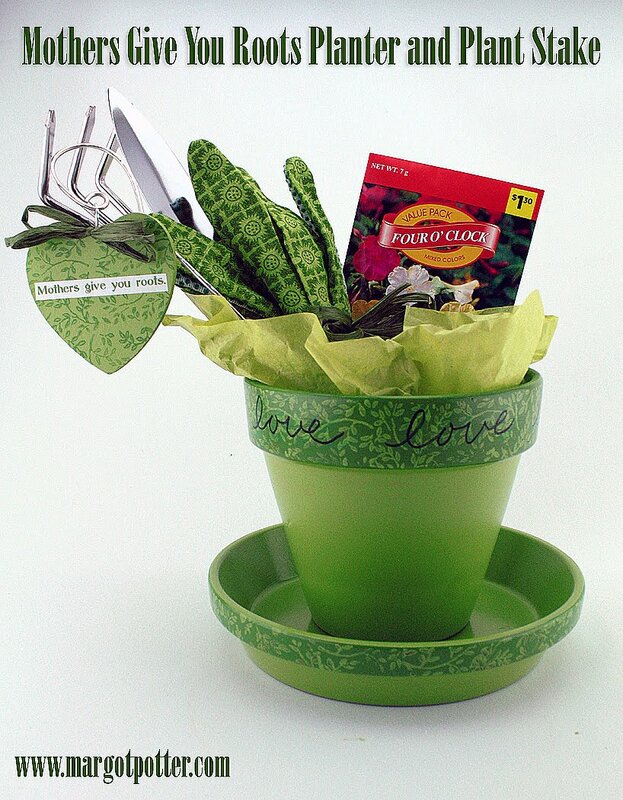 Print out: ‘Mothers give you roots.’ Use a green ink and an easy to read font, mine is 18pt. and the font is Abyss. 7. 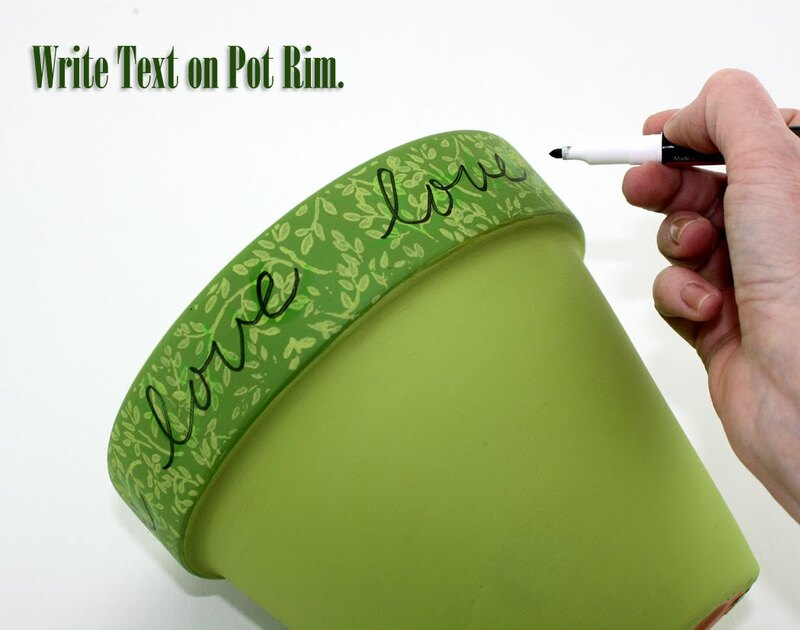 Use green marker to write love around edge of pot working your way around, go over that with the black marker. 8. Working outside and allowing to dry between coats, spray 2 layers of Aleene’s matter sealer on pot and saucer. 9. 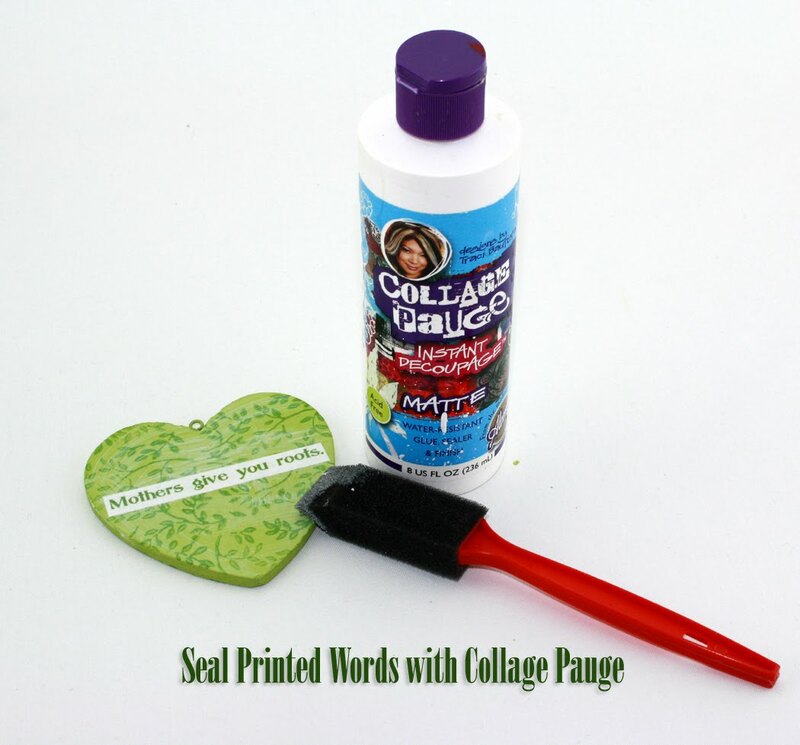 Use decoupage medium to apply the cut out sentence to one side of your heart. Allow to dry. You can seal this with 1-2 coats of the spray sealer if it’s going to be outside. 10. Use raffia ribbon to tie a multi-loop bow around top of heart ornament. Wrap your gloves and garden tools in raffia making another multi-loop bow. 11. Use round nose pliers to bend a loop on one end of a 2” segment of 10 gauge craft wire. Create a hook by bending wire over a round dowel (I used a metal dowel; you can use a thread spool or whatever you have at hand.) If you want to 'work harden' the wire to make it more stiff, hammer on a bench block with the flat side of a ball peen hammer. Follow by adding texture with the round end. Use jump ring and two pairs of chain nose pliers to attach heart ornament to end of plant stake. 12. To assemble for gifting cut some foam to fit inside center of pot, cutting out a segment for the gloves and tools. Poke a small hole for plant stake. Add some coordinating tissue paper and insert tools, plant stake and add your seed packet. 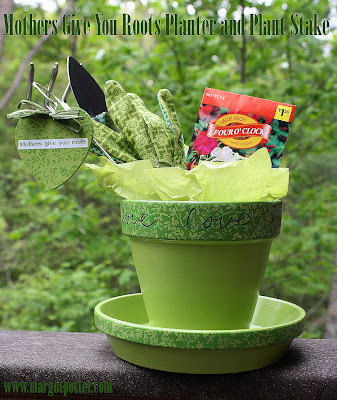 What a great crafty gift idea! It will also make a great gift for grand parents. Thanks! You could take this in so many directions, even for a baby shower gift with onesies and baby stuff in the pot.